My friend, Karyn Duggan, who happens to be a nutritionist made a crumble at her dinner party that made me crumble to my knees? Sorry, can’t help it. Seriously though, it was so good that I had seconds and thirds, which is why the photo she shows of the recipe on Pinterest, is of an empty bowl. The crumble happens to be gluten free, but in the way that corn tamales are gluten free… it was tasty and sinful. btw. This friend happens to be GORGEOUS, as is her daughter. 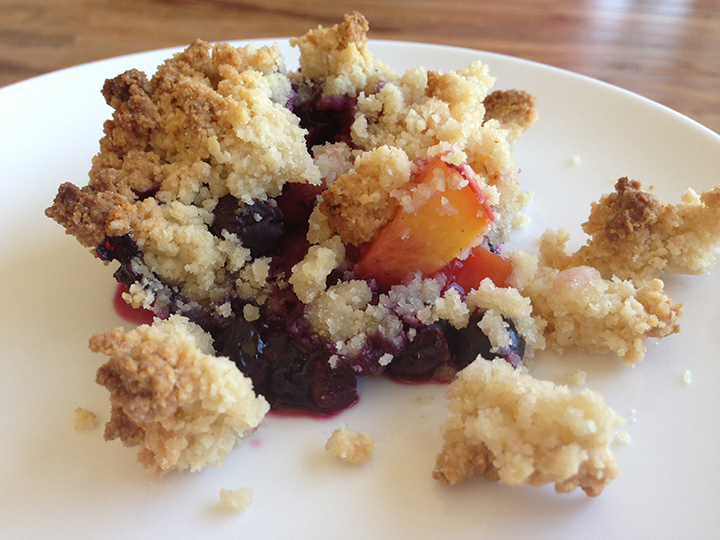 They have bright and glowing skin and always seem pretty healthy and energetic, so I figure this crumble might be the key? My favorite part of this dessert is the ‘crumble” itself, which you will see is comprised of mostly almond flour and brown rice flour. Recipe below photos. Crumble in it’s raw state. This one is right up my alley:)). Will be in Scarsdale the week of 7/28. Can’t wait to see you!! !